Once you've made it to the recipe form, using any of these methods, it's time to add your recipe details. Got an existing recipe to start from? 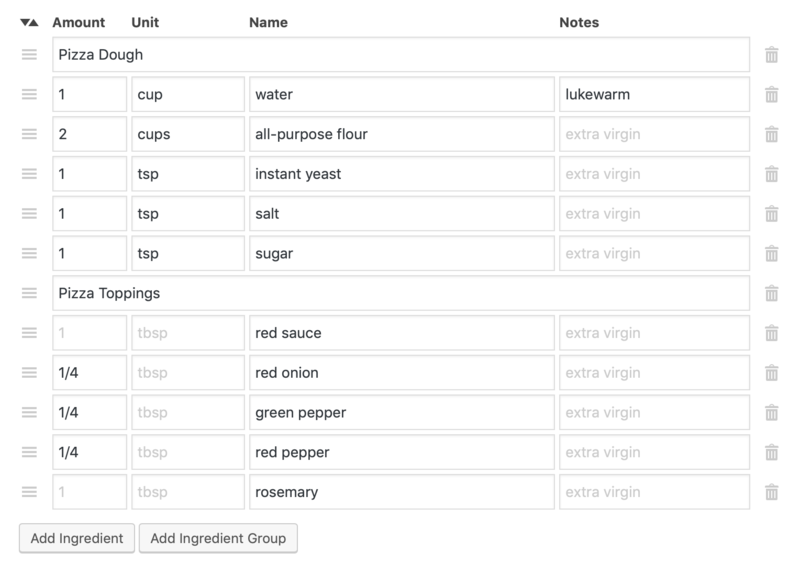 Instead of filling in all fields manually you can import a recipe from text to speed things up and get a lot of the fields already filled in. 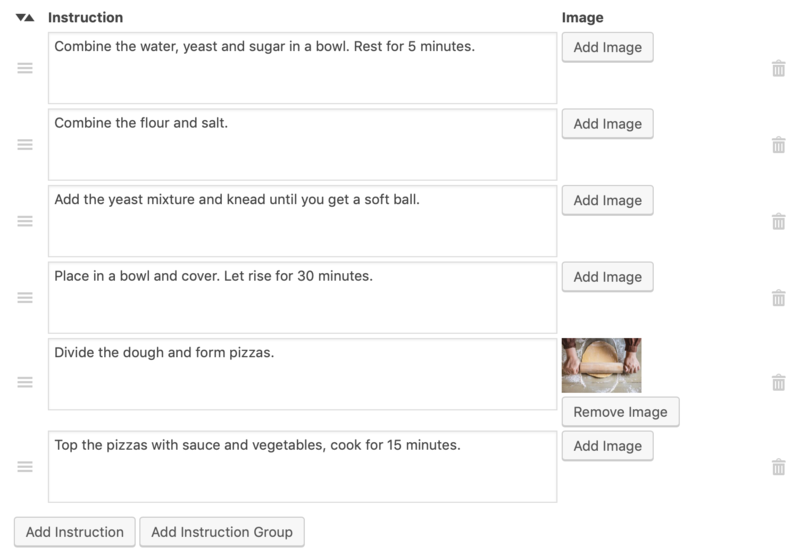 This will not work for ingredients, but we do have an ingredient links feature in the Premium plugin you could use. You are not limited to these defaults, however. Just type anything you want and press ENTER to confirm. Multiple terms can be added for each taxonomy. Our plugin needs the ingredients split up in 4 different pieces for some of our advanced functionality to work. To speed up the process of entering ingredients we highly recommend using the TAB key to jump from field to field. This will automatically create a new ingredient for you when you reach a new line. Click the "Add Ingredient Group" button at the bottom to add a different ingredient group (think "Frosting" and "Cake"). The icons can be used to drag ingredients around or delete them again. Every instruction step should be in its own box. These will automatically be numbered, so you should not type those yourself. To speed up the process of entering instructions we highly recommend using the TAB key to jump from field to field. One image can be added per instruction step. Click the "Add Instruction Group" button at the bottom to add a different instruction group (think "Frosting" and "Cake"). The icons can be used to drag instructions around or delete them again.